If we thought spring weather was here to stay, we were wrong. Today the temperature is in the mid-30s, and we are having snow flurries all morning. The wind is so cold. All is quiet here at the Eichers. Everyone is gone for the day. I did the morning work, mopped the floors and am folding laundry. I’m hoping to make butter yet before the girls get home from work. Susan wants to bake sugar cookies when she comes home. These cookies have buttermilk as one of the ingredients, so I thought I’d make butter so we have some. Susan’s last day at the RV factory is Friday. She wants to take cookies to work to treat her co-workers. On Monday she will start working for nephew Emanul. He has a woodworking shop and has quite a few employees. Lovina and Kevin were really excited on Saturday. Daughter Susan’s friend Mose bought them each a little baby duck. 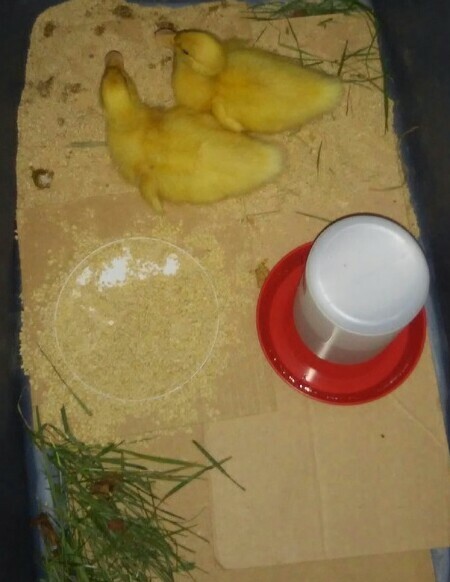 They named them Donald and Daisy and have had so much fun taking care of them. They keep them in a box in front of the coal stove in the basement. I hardly ever hear them. They aren’t as noisy as the little chicks that we have had in the house already. This is the first time we have had ducks, so the children are eager to see how they will be for pets when they get older. Once the weather warms up they can move them out to the barn. The Eicher children are enjoying their new baby ducks, Donald and Daisy. Congratulations to nephew Levi and Barbara! We received an invitation to their May 14 wedding. Levi is sister Leah and Paul’s son. I will be a cook at their wedding. They would like the cooks to wear royal blue dresses. It looks like I will get another new dress. I really need to get to my sewing. Son Benjamin could use more work pants. I have several cut out for him but need to sew them. Once I get started it won’t take long. Pants are easy to put together and sew. Everything has been so busy this spring that my husband Joe hasn’t had much time for fishing. Son Benjamin went fishing Friday evening with Mose and two of his brothers. Saturday evening Benjamin and Joseph went fishing for a few hours after the work was done for the day. Timothy (daughter Elizabeth’s friend) bought a bigger place and is in the process of selling his. He has a bigger and newer house and more acreage on the new place. He has some woods on the property, and a river runs behind it. We want to help him move once he’s ready. My rhubarbs are really growing. I am hoping I’ll have some to use in a week or so. Try this rhubarb coffee cake when your rhubarbs are ready. In a large bowl, cream sugar and shortening. Add egg. Add dry ingredients alternately with sour cream. Fold in rhubarb. Spread in greased 9×13-inch pan. Combine topping ingredients; sprinkle over batter. Bake at 350° for 45–50 minutes. Sounds like your busy as usual Lovina!!. the ducklings are darling, won’t be long before they can go in the water. I will try this cake recipe as my rhubarb will be ready in a few weeks. thanks for sharing the recipe.